From the West: Go East on HWY 36 toward Stillwater to stop lights at Osgood. Turn Left onto Osgood and drive approximately1/2 mile to 6381 Osgood Ave North. Turn Right at Orchard Park sign "6381 Orchard Park Professional Buildings" into parking lot. Enter middle building Suite # 7 downstairs. See SkinPros sign at top of stairs. 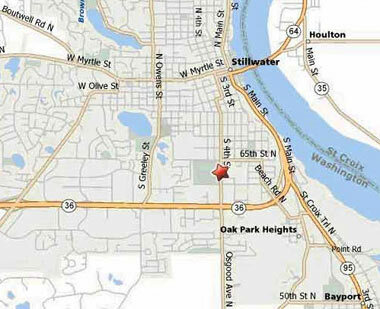 From the East / Downtown Stillwater: From Downtown Stillwater follow HWY 36 West to stop lights at Osgood. Turn right onto Osgood and drive approximately 1/2 mile to 6381 Osgood Ave North. Turn Right at Orchard Park sign "6381 Orchard Park Professional Buildings" into parking lot. Enter middle building Suite # 7 downstairs. See SkinPros sign at top of stairs.